This space will present on a weekly basis an example of one or more so-called "conservatives" who says or does something clearly showing they must hate America and the ideals we hold dear. 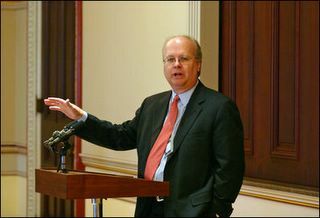 On June 21, 2005 Karl Rove suggested in remarks to the New York Conservative Party that liberals did not heed the call of national security. His comments that conservatives calling for war was pro national securtity and liberals calling for indictments was anti national security shows a blatant disregard for American values. On September 11, 2001 a terrorist group attacked the United States. In this country running a jet plane into a building is against the law and we are a country that believes in the rule of law. The perpetrators should be brought to justice. To date, we have may have detained some of the people responsible for the September 11, 2001 attacks, but we have not yet brought them to justice. In order to detain these people we needed to invade another country that harbored the criminals and would not cooperate, Afghanistan. President Bush did this with the support of conservatives and liberals as shown by adoption of Public Law 107-40, "To authorize the use of United States Armed Forces against those responsible for the recent attacks launched against the United States," with bipartisan sponsorship and votes on House Joint Resolution 64 (passed 420 to 1) and Senate Joint Resolution 23 (passed 98 to 0). To say, as Mr. Rove did, that liberals did not heed the danger and to impugn the patriotism of liberals is a lie. Deputy Chief of Staff Karl Rove, your statements show that you hate America. Deputy Chief of Staff Karl Rove, Impugning the Patriotism of Liberal Americans is Deplorable!